The Lifelong AIDS Alliance is having their 19th annual AIDS Walk, Saturday, September 10 [today] at Volunteer Park. It’s not too late to register for those still interested -registration begins tomorrow morning at 8:00 am, events and walk at 9:00 am. 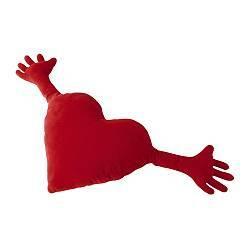 Ikea is also doing it’s part by donating all proceeds from the September sales of the slightly creepy, yet cuddly, Famnig Hjart (that red heart pillow with arms), to the American Red Cross Hurricane Relief Fund. They’re only $9.99, so stock up…and you won’t have an excuse for v-day.